When you think of cancer, you may not think of it as a long-term condition. In fact, 40% of cancer survivors are unaware of the long-term side effects of cancer and its treatment, despite 65% saying they’ve had to deal with fatigue during and after treatment. These long-term effects – such as persistent hair loss, depression, fatigue, nausea and loss of confidence to name just a few – can impact their everyday lives, including at work. Each year, almost 120,000 people of working age are diagnosed with cancer in the UK, and with survival rates improving and people retiring later, this figure is set to rise. With 82% of people wanting to return to work after cancer treatment but 47% having had to give it up or change roles as a result of a cancer diagnosis, it is important to ensure that the right support and advice is available early on to prevent staff falling out of work when they don’t wish to. It is particularly important to take these long-term effects into account when managing or working with someone with cancer, as cancer is classed as a disability under the Equality Act or Disability Discrimination Act (DDA). This means that employers are required, where reasonable, to make changes to help the employee with cancer do their job during and after treatment, and aid them in overcoming any disadvantages they may face as a consequence of their disability (cancer). When the employee feels ready and able to return to work, employers should take the time to discuss their needs and implement reasonable adjustments where possible. Often these are minor changes- for example, giving time off for medical appointments or allowing them to work flexible hours – but these small changes can make a big impact in helping someone’s return to work. However despite the need for this support and knowledge, line managers are often ill equipped to offer the right level of information to help manage employees affected by cancer. 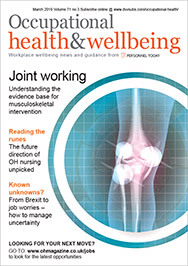 Organisations urgently need to develop a health and wellbeing at work strategy that recognises the needs of rising numbers of employees with long-term conditions. This is why Macmillan has developed Macmillan at Work, which offers workplace training, consultancy and resources to help HR and line managers support people affected by cancer at work. The Macmillan at Work programme focuses on cancer, but much of the advice is also relevant to other long-term conditions. Evidence shows health support in the workplace can help prevent people falling out of work due to ill health. Remaining in work can have a positive impact not only on wellbeing and helping to preserve livelihoods of those with long-term conditions, but also benefits organisations in retaining knowledgeable staff, as well as fostering a positive work culture and loyal workforce. However, often the journey following a cancer diagnosis is not straight forward, as cancer brings an enormous shift in anyone’s life and it can take months or even years to come to terms with what has happened. In some circumstances side effects do not become apparent until after the treatment has finished. Therefore regularly reviewing the support an individual may require is key, and implementing new reasonable adjustments may be required along the way. The building blocks of a good health and wellbeing at work strategy include policy, training and support programmes that raise awareness and address the needs of employees, and ensuring that relevant staff (such as line managers and HR) are equipped to support colleagues affected by cancer as well as other long-term conditions. To find out about the expert training, guidance and resources Macmillan provides, visit macmillan.org.uk/atwork. You can also email the team at workandcancer@macmillan.org.uk or call 020 7840 4725. Training and support for managers. Right now, or sometime soon, you will have to deal with cancer in the workplace. Macmillan’s experience with people affected by cancer makes us ideally placed to help you. 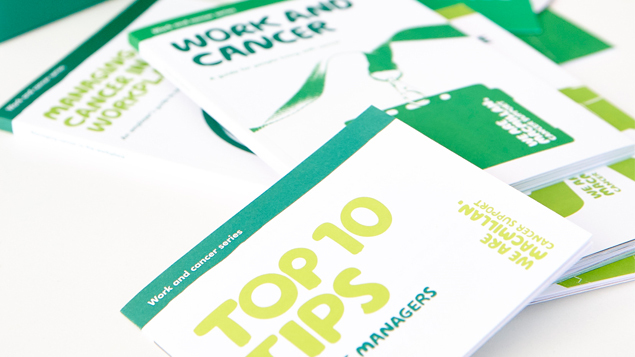 Join to receive your free Toolkit and access expert training and resources to help you support employees affected by cancer www.macmillan.org.uk/atwork.